The Philippines is indeed a mystical country. 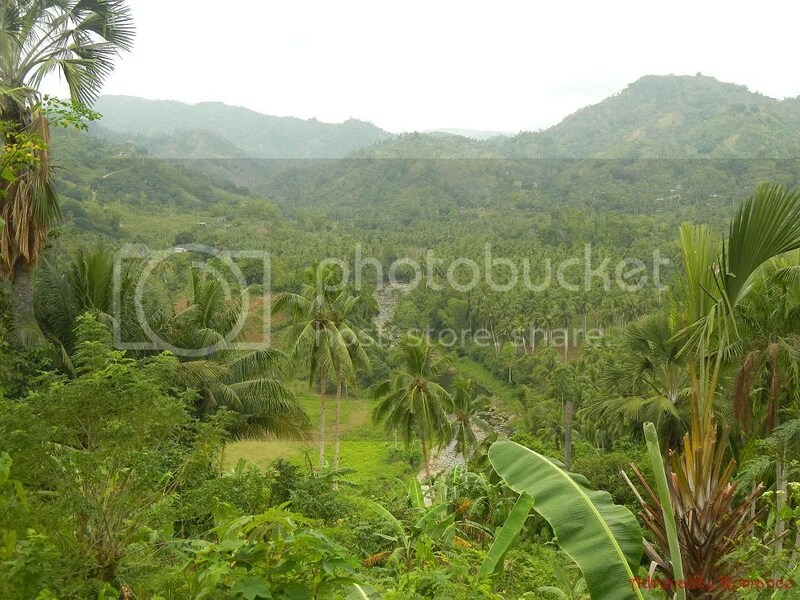 Each hidden corner or secret nook in the Philippines has its own share of mystery and magic. Snippets of the place’s secrets leak out in the form of whispered local folklore. The most common folklores involve spirits and ethereal beings guarding the most beautiful locations in the country. Trespass, deface, or disrespect the place, and you’ll suffer the spirits’ wrath, so the locals warn. We had a chance to visit one of these strange places filled with otherworldly energy last March 16, 2014. 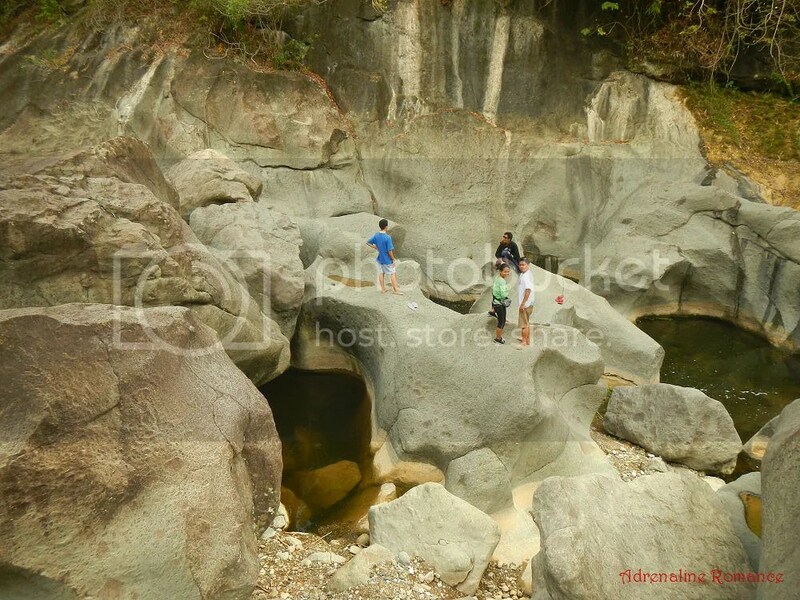 Thanks to Ma’am Agnes Quiño Amor, fellow adventurer and a government official of Compostela, Cebu LGU, we were able to set foot one of the most scenic, most unusual, and most enchanting rivers in Cebu—the eerie Mulao River. Our adventure started off at the newly renovated Compostela Municipal Hall. The exterior design is a nice blend of classical and contemporary architecture. 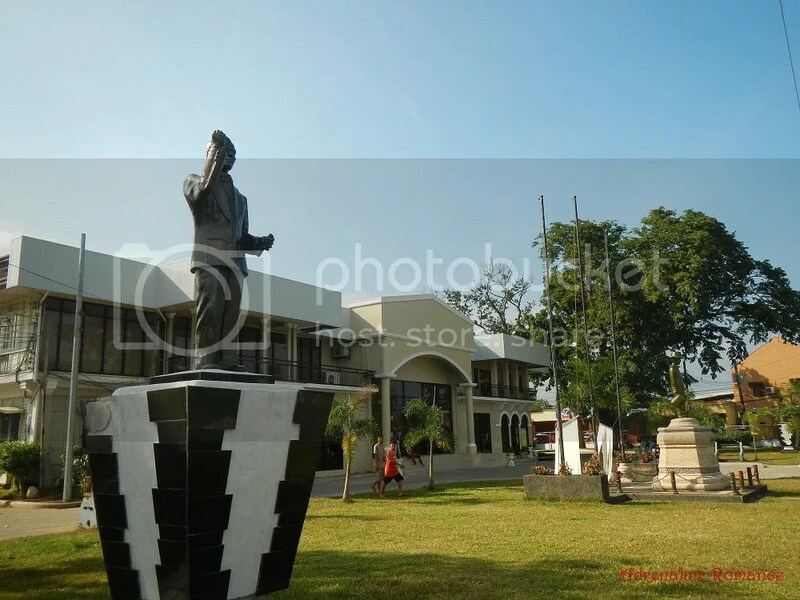 With large green areas and statues of important figures at the façade, the Compostela Municipal Hall is a pleasant sight. 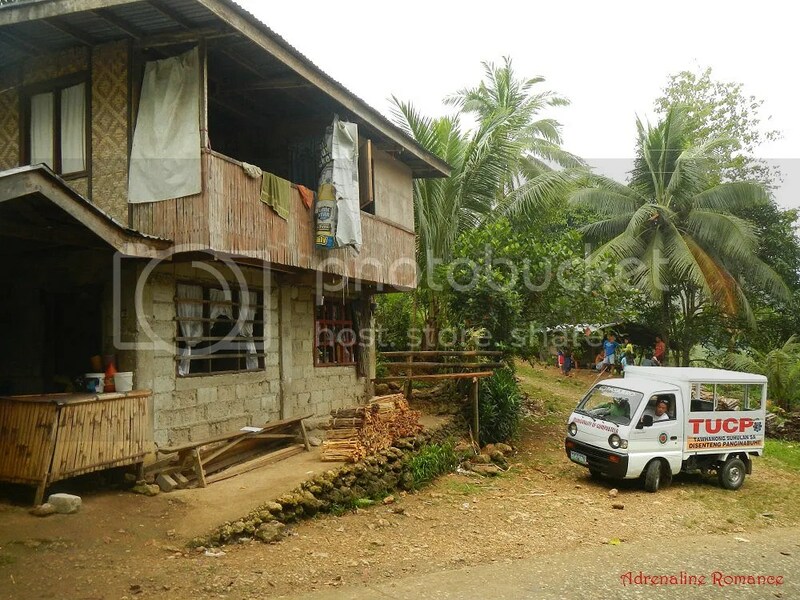 Agnes had already arranged our transportation to Barangay Mulao. 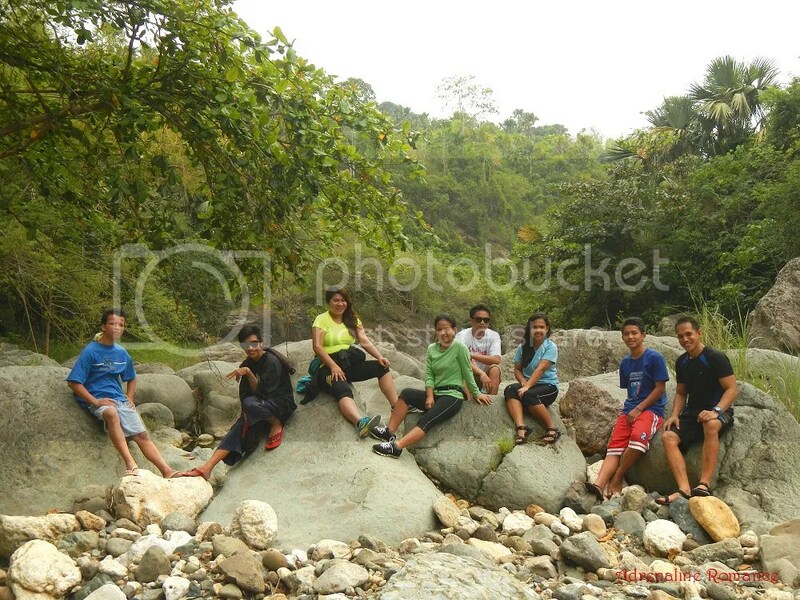 And it was definitely a privilege for us because transportation was courtesy of Compostela’s tourism office and LGU. Yes, it was our first time being invited by a local government unit. On our way, to Mulao River, we stopped by Agnes’s auntie’s store to buy something to eat and to change a flat tire. 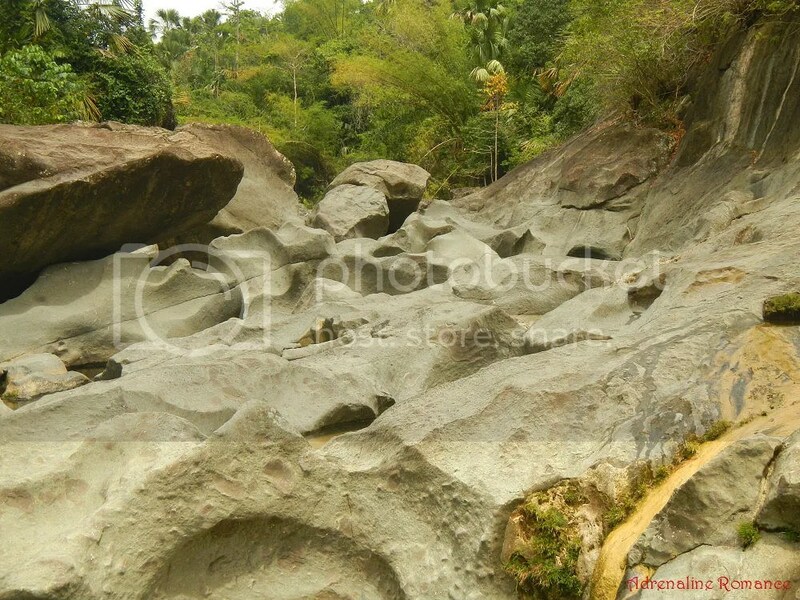 The mountain road leading to the river have damaged and unrepaired sections. But don’t think of this as something negative. In fact, the relatively rough road that features an uneven surface and rolling terrain makes it a perfect bike route. 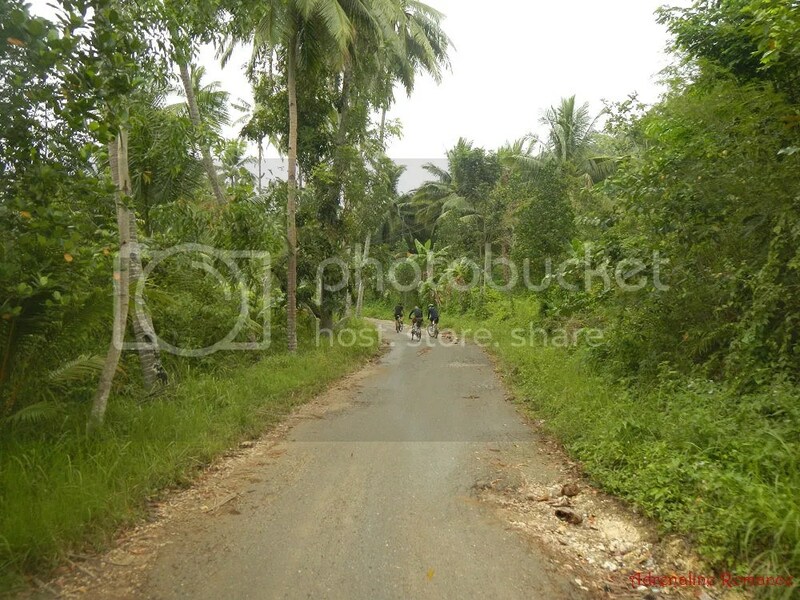 According to Ma’am Agnes, this particular road is fast becoming a favorite haven for local bikers. After half an hour, we arrived at Ka Sisoy’s Place, which is simply a combination home-and-store structure, very common in both Philippine lowlands and highlands. If you’re riding a habal-habal, just tell the driver to stop at Ka Sisoy; practically every habal-habal driver knows where this is. Ka Sisoy seems to be a popular stopover. It was also here where you can ask for locals who can guide you to the river. Agnes had already arranged the guides before we came, so, no problem there. After a bit of stretching and nibbling on some junk food, we set off toward the river. The rolling trail traverses through light woods, shrubs, and gentle slopes. 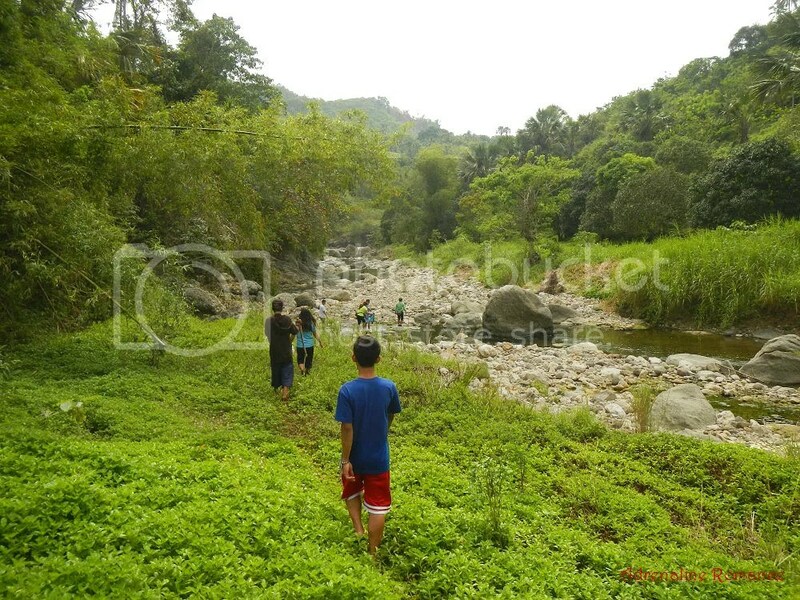 In less than 30 minutes, we saw the beautiful Mulao River, which snakes through the valleys between Central Cebu’s mountains. Mulao River connects both the municipalities of Compostela and Liloan. 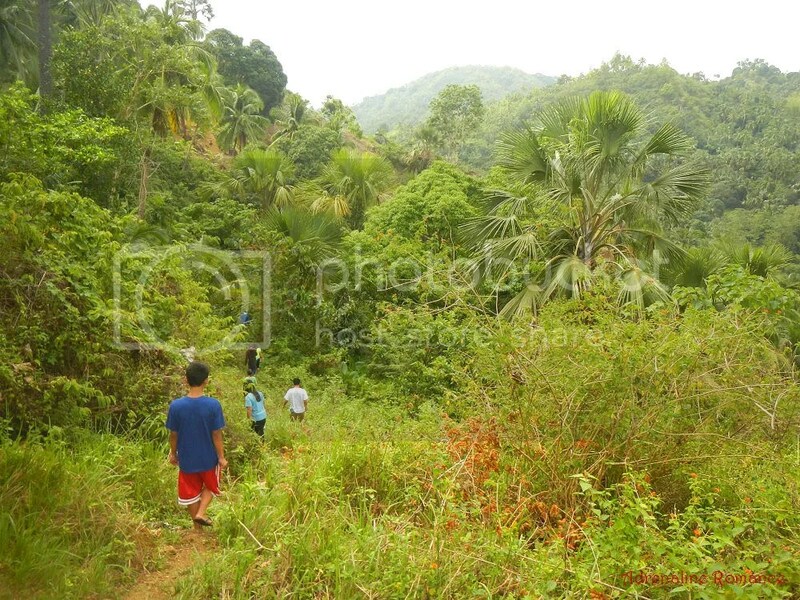 On the way to the foot of the river, we came across vast tracts of farmlands that grow various forms of produce—mangoes, corn, coconuts, root crops, and others. 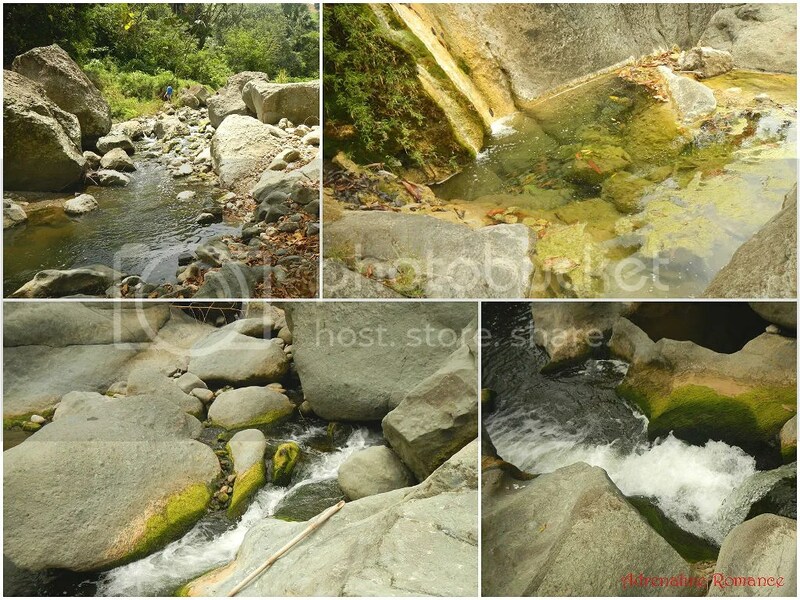 Water and minerals from the Mulao River nourishes the soil in nearby areas, making them fertile and rich in nutrients for plants. In less than an hour, the green grasses, shrubs, and trees gave way to the river. At first glance, Mulao River seems like an ordinary rocky river. Just like many other rivers, we needed to get a little wet to explore the river. But that was okay. The warm, flowing water felt really good and soothing on our hot, tired feet. As we moved farther down the river, the true nature of Mulao River began to unfold. We crossed great slabs of unusually shaped rock like the one in the photo below. The boulders became larger the farther out we went. Look at those gigantic boulders! You can easily see how large they are by comparing their sizes to the people beside or on them. 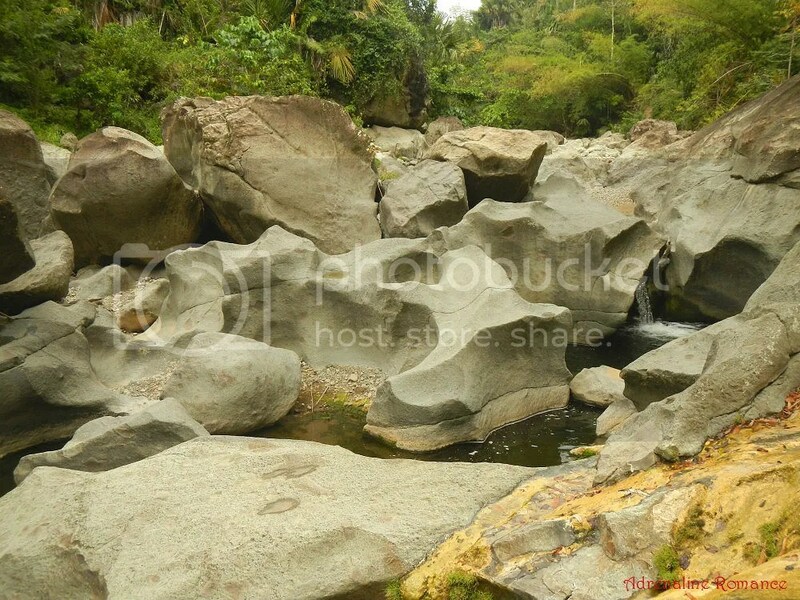 These boulders make up the mysterious soul of Mulao River. What makes them so large despite the constant erosion? Why do they have smooth sides? Indeed, they look like enormous aquarium pebbles! 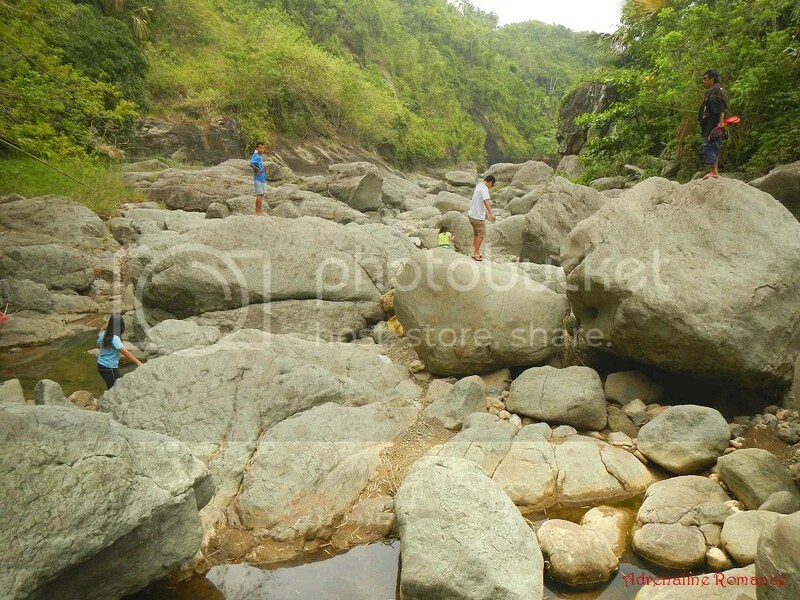 Going downriver means that we had to walk around, climb over, or crawl under these huge rocks. Along the way, we were simply amazed at Nature’s hand in shaping these beautiful rocks. 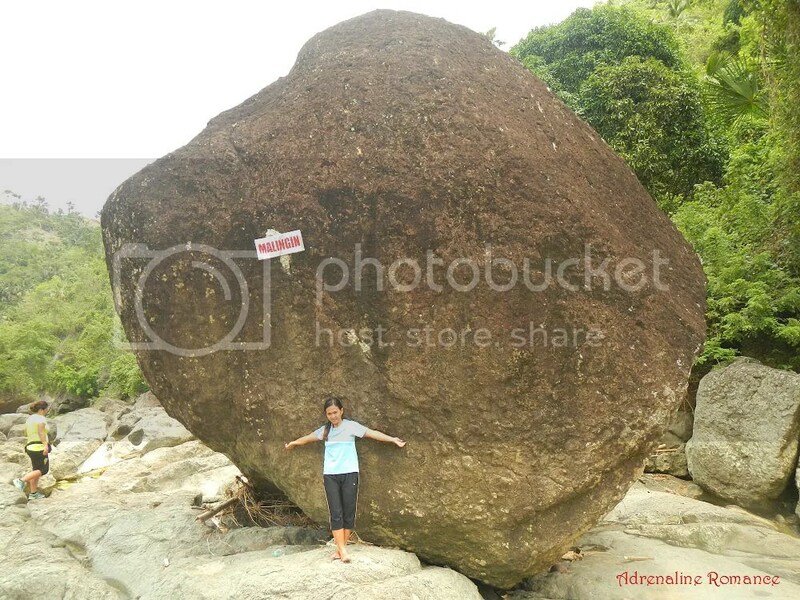 Just look at how huge that precariously balanced boulder is! 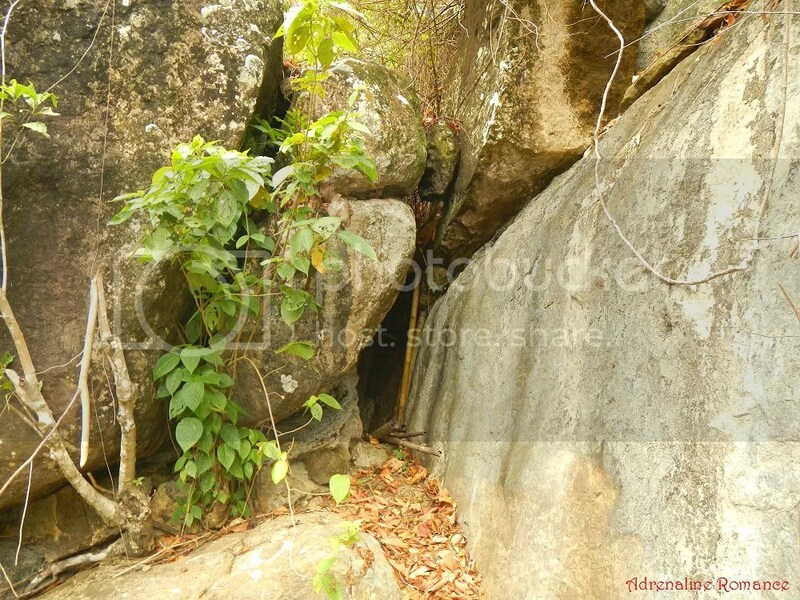 It seems that if a small rock or pebble is taken away from that natural “lock” or if given a gentle push, that boulder would topple down. 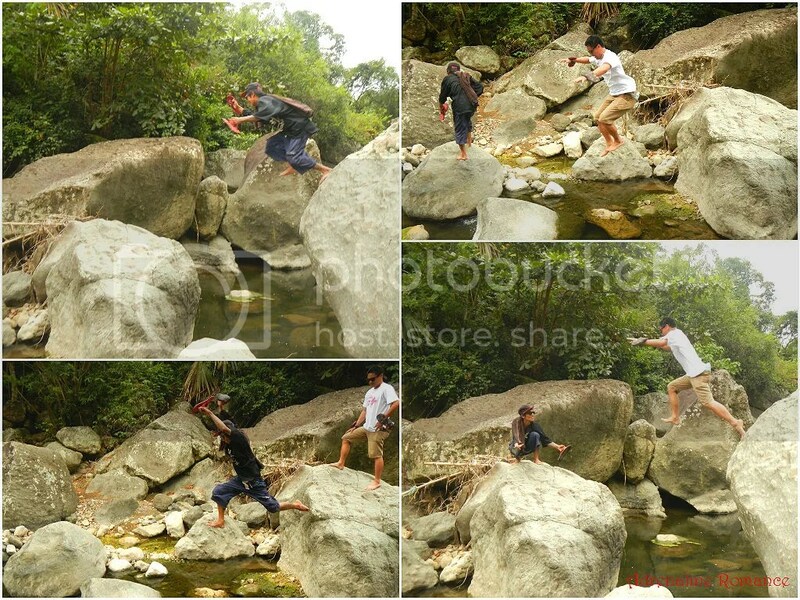 Those big, tall boulders make perfect launching platforms for these stuntmen! Hehe! Actually, our teenage guides are quite adept at jumping from one boulder to another as they are quite familiar with where to land their feet. Us? Well, let’s just say we stayed on the side of safety. The farther we headed down river, the larger the boulders became. 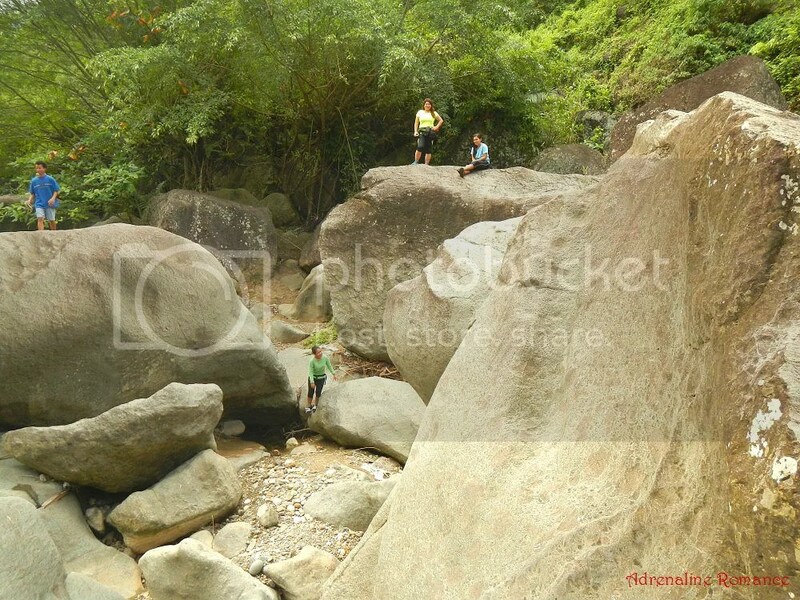 Check out the photo below and compare the size of the people against those boulders. Although the river’s mighty flow may have disappeared eons ago, water still rushes through the many narrow channels, streams, and tributaries that flow through the river. Our guides told us that the river roars to life during very heavy rain, however. 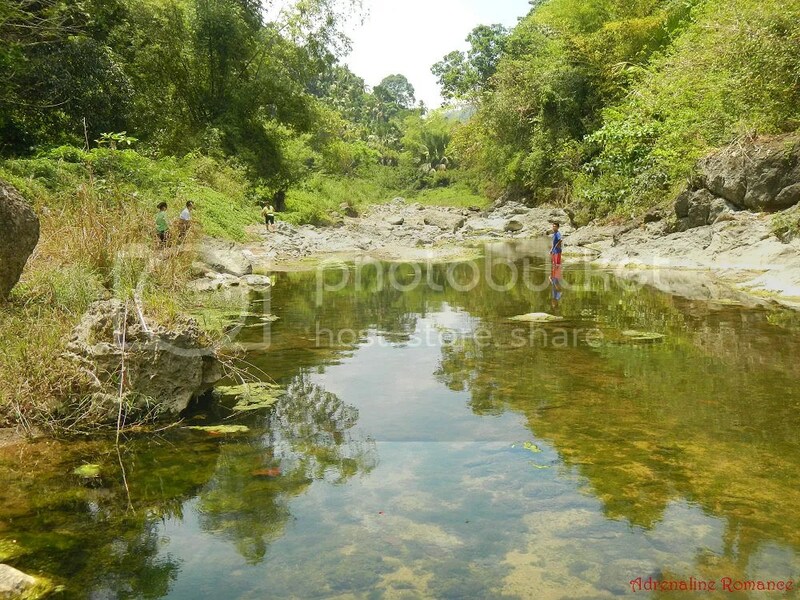 After taking a short break, we went further downstream where three of Mulao River’s highlights are located. It was a good thing the weather was a bit cloudy because we would have roasted from both the sun’s heat and the boulder’s ambient heat. Be careful! One step at a time! And most importantly, according to the guide, we should say, “Tabi! Agi lang mi” (Make way. We’re passing through) as we cross this section. By saying this, we’re asking the permission of the spirits that dwell here to pass by. If one fails to ask their permission, these spirits might get angry. When that happens, they may strike the trespasser with a mysterious and incurable malady, beset the trespasser with misfortune, lead the trespasser to nowhere (this phenomenon is called lamat in the local dialect), or cause the offending person to suffer a gruesome accident. 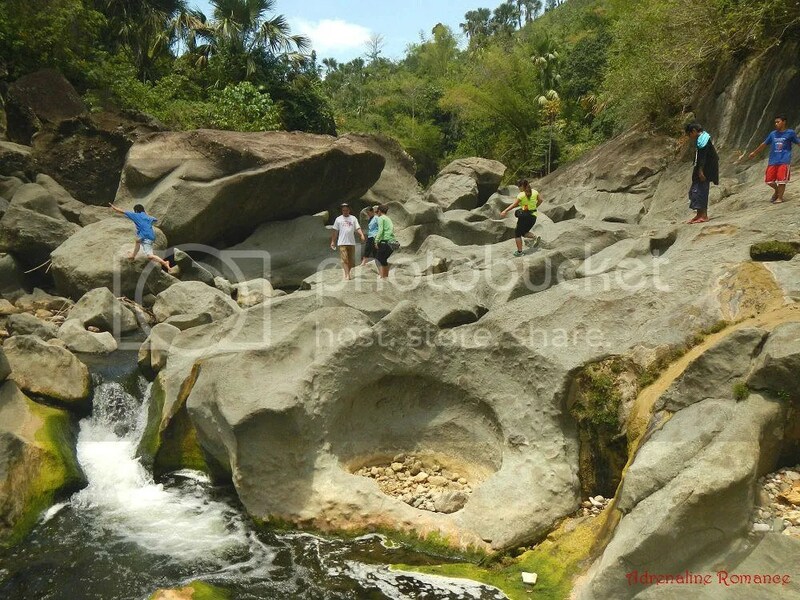 After awhile, we came to the first main highlight of the river, an enormous boulder precariously perched on two slabs of rock. 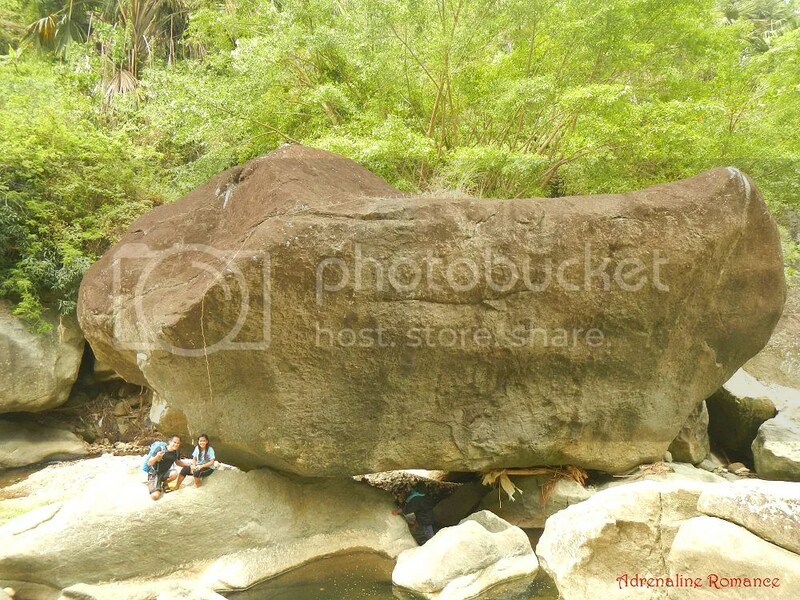 Locals call this huge boulder The Golden Ship. At night, the ship sails out toward the sea—complete with lights and ghost crew—-carrying a cargo of cacao plants. Before dawn strikes, The Golden Ship returns to its permanent perch, waiting for another night of voyage. At night, locals could hear sounds coming from the river as if signaling that the ship is leaving the port. As strange as it may sound, The Golden Ship sails along these streams of cascading water. 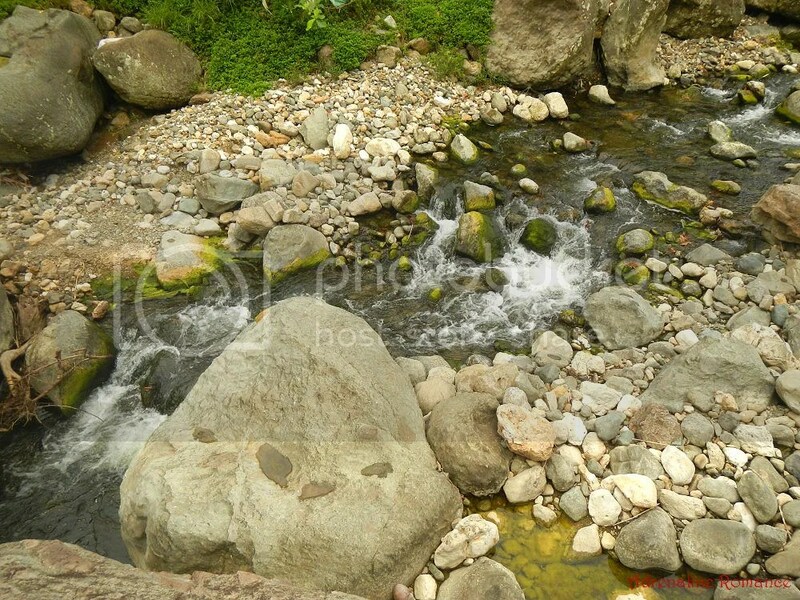 Fresh, clear, cold spring water from the mountain flow down in rivulets toward the river during summer. When the moon is full, the trickling water is magically infused with powerful healing properties. However, guardian spirits strictly prohibit mortals from drinking or collecting the healing fluid. 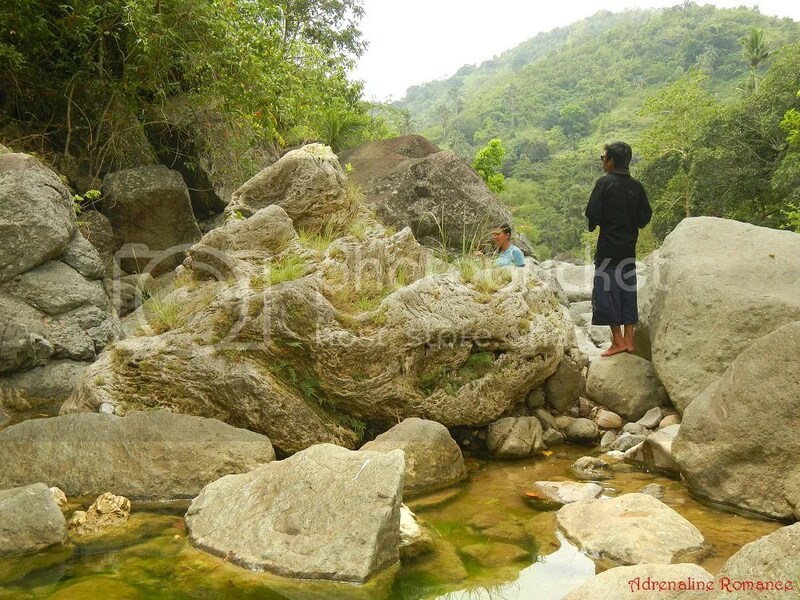 Rounding off The Golden Ship, we came to the next highlight of Mulao River, a mysterious place called Busong-busong. 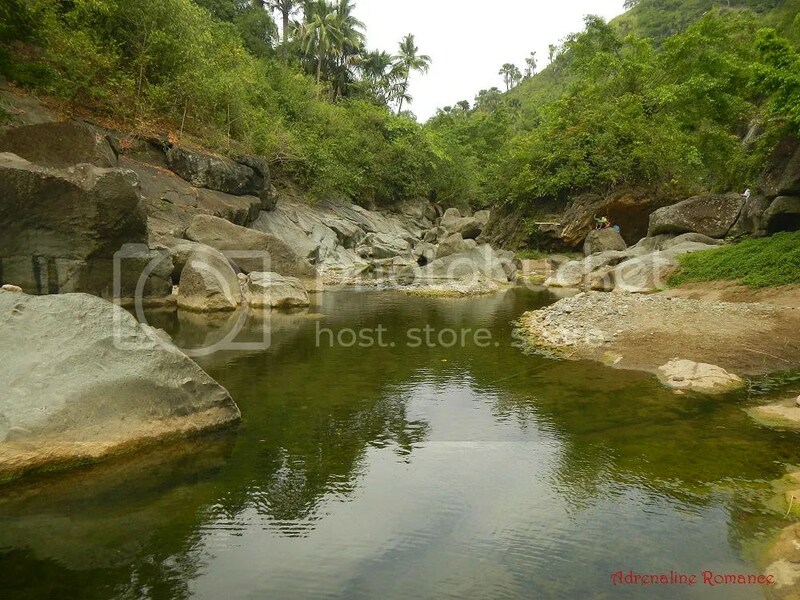 This part of the river features smooth, strangely shaped rocks with pools of greenish water in between. 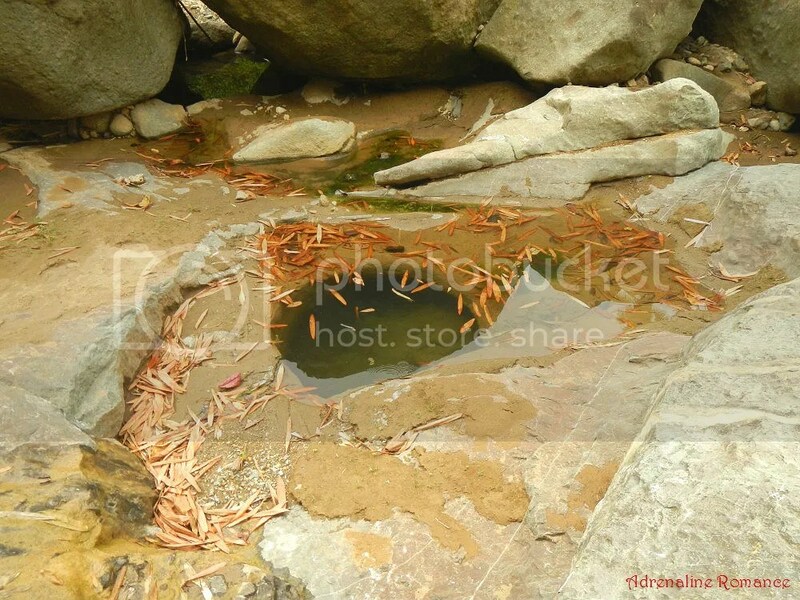 Locals say that these pools are the true homes of the spirit guardians here. Mortals can take a dip here, but they have to ask the permission of the spirits. 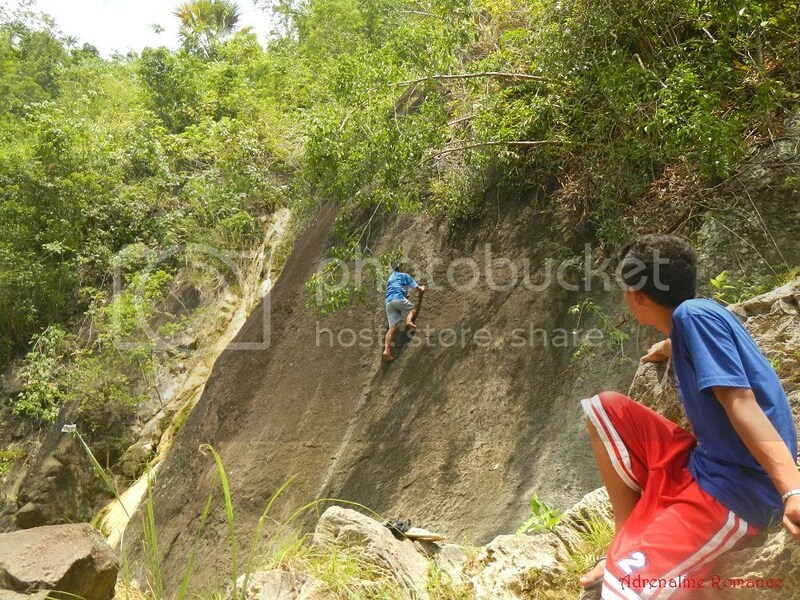 At this particular angle, the landscape of Busong-busong resembles waves. Could it be that at night, an unknown magical power transforms these wave-shaped rocks to water where The Golden Ship can float on? Busong-busong is as beautiful as it is mysterious. Here, in this serene place, we felt the power and spirit of Mother Nature. This rock is different from most others. While the immense boulders around it are relatively smooth, this one resembles a wad of paper mache. Another evidence that Mother Nature, indeed, has her own way of creating an unusual thing within an unusual thing. Sinkholes such as the one in the photo below hold a lot of secrets; perhaps they are gateways to an ethereal dimension. Be careful; some sinkholes are quite deep. Several of them are said to be responsible for mysterious disappearances in the community. As long as mortals ask permission from the spirits that make this river their home, it’s fine to share such dwelling. 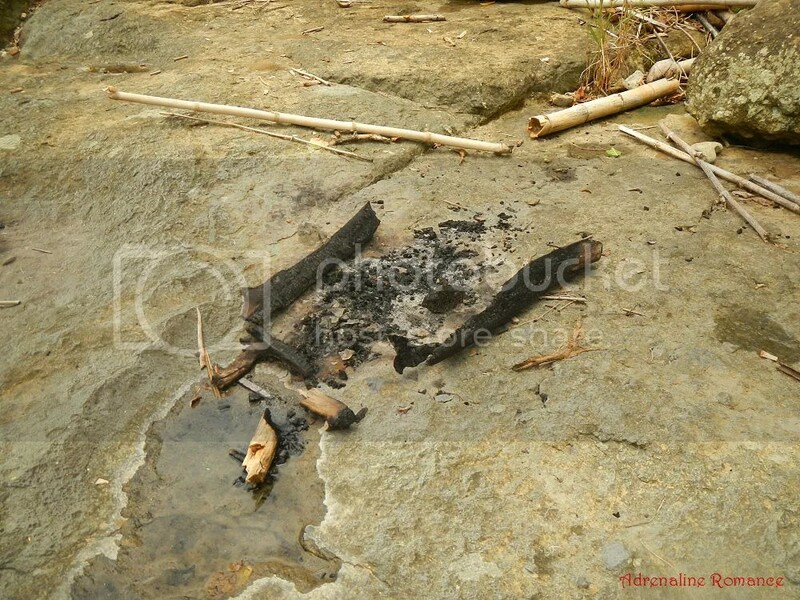 The presence of burnt wood indicates the presence of local hunters or bushcrafters seeking crabs or catfish, which end up as a filling meal. Farther along the river, we found this man-made contraption nestled between a cliff and large rock. Our guides believed that this is the remains of a mine. However, basing on what local history we learned, we believe that this was a hiding place for weary locals who fled away from Japanese soldiers during World War 2. What a beautiful, unspoilt river scene! 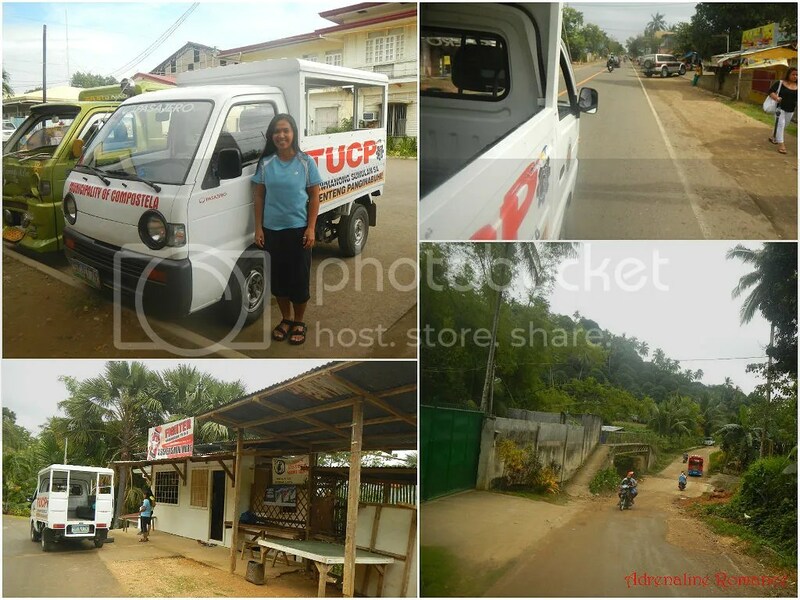 We headed in a southward direction towards the municipality of Liloan. 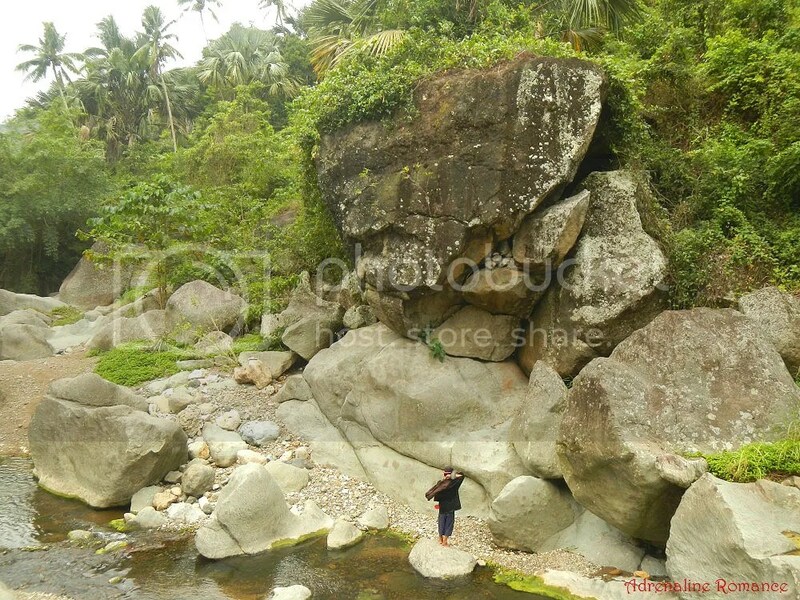 Near the Compostela-Liloan Boulder is this colossal, nearly round boulder that is aptly called Malingin (translated into “round”). Officially, however, this is a marker for Barangay Malingin. How that enormous boulder got there is anyone’s guess. After taking a few photos of the place, we headed back towards our starting point. Along the way, we saw this pool of glass-smooth water. It’s extremely beautiful, but according to the guides, this pool of water has a dark secret. Local folktales say that the water turned to blood after cruel Japanese soldiers captured hundreds of local residents hiding in the river during World War 2. The civilians were stabbed one by one and were then thrown into the river. Perhaps, the spirits that forever watch over the mystical Mulao River are the souls of the victims of this massacre. On our way back, we found this giant rock with an overhung “cave.” Sweetie and I looked at the boulder and then at each other. It’s perfect for bouldering! Thank goodness we brought our climbing shoes and chalk bags. 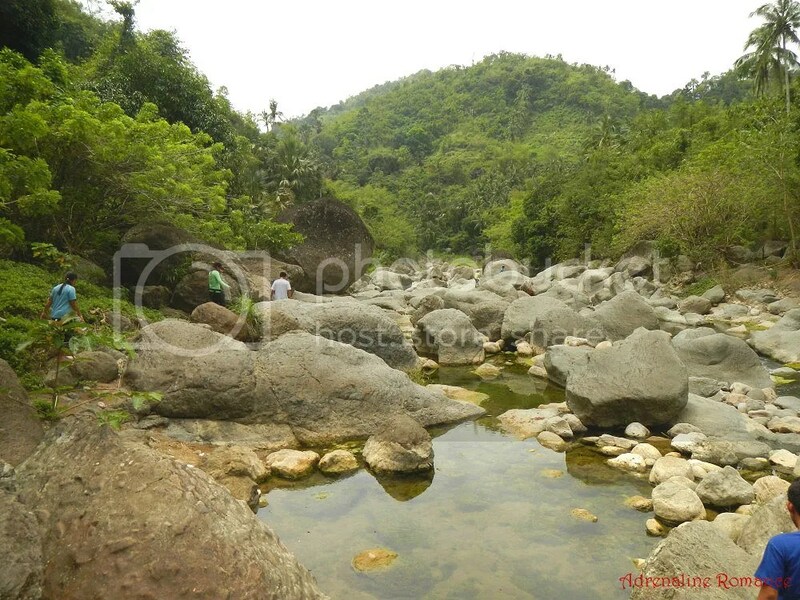 A few days before the adventure, Agnes mentioned that plenty of gigantic rocks dot the river. 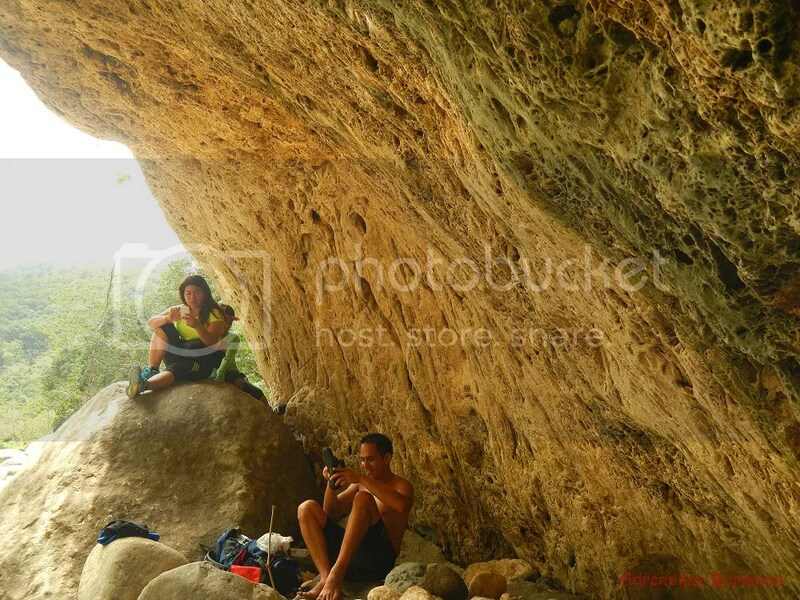 We figured out that some may be perfect for bouldering, thus, we brought our gear. 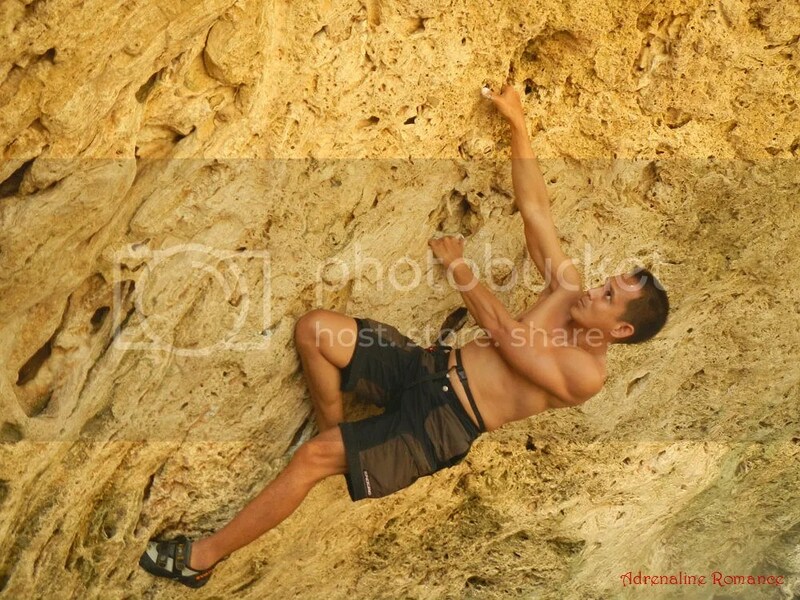 Bouldering is a kind of rock climbing that is done without using ropes, harnesses, quickdraws, cams, or other climbing hardware. 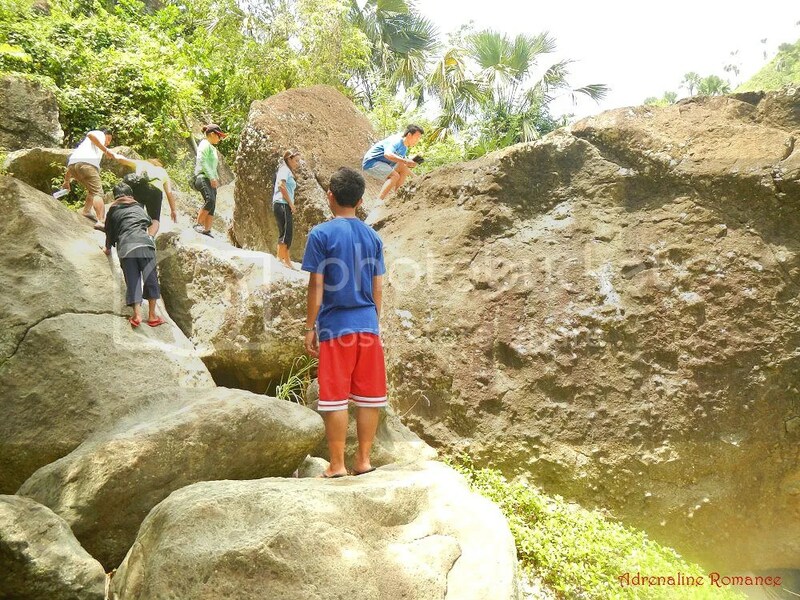 The activity takes place on rock faces and boulders that are less than 20 feet tall. 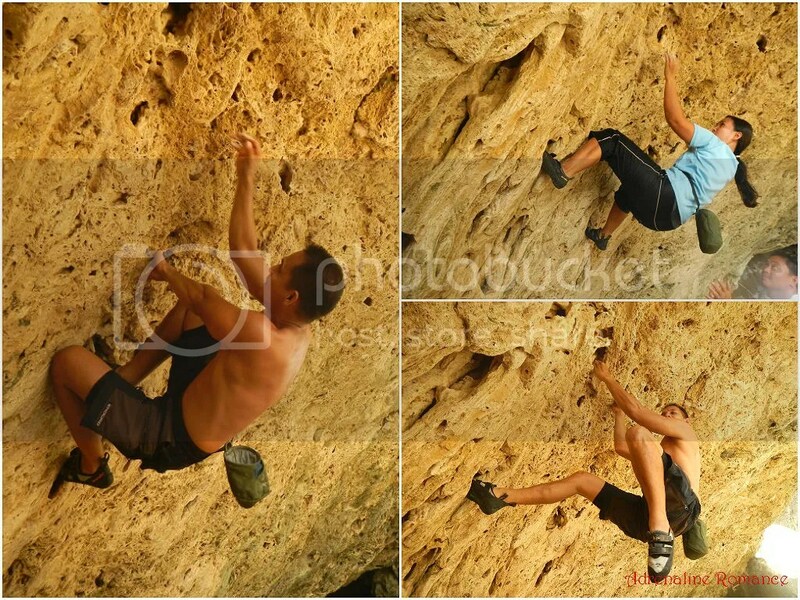 Bouldering once originated as a training method for mountaineering and roped climbs. 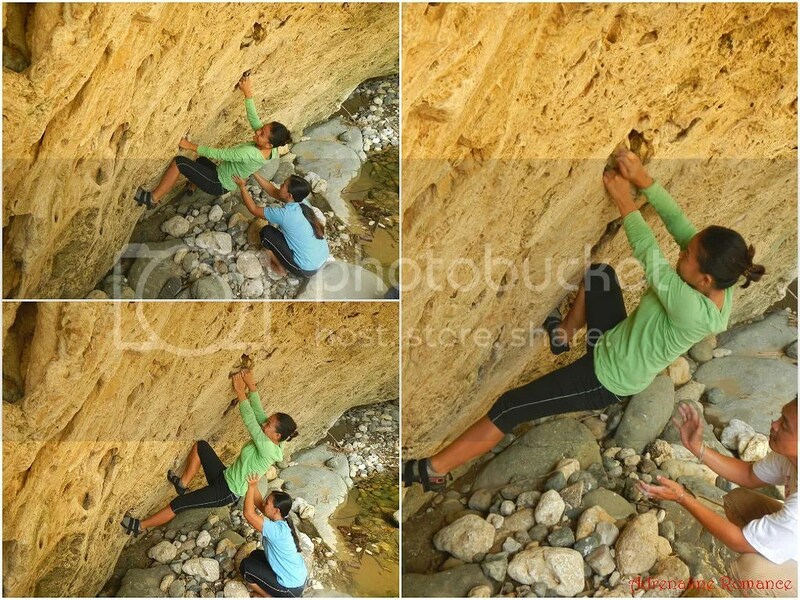 However, as time went by, it evolved into a different climbing discipline altogether. Because we don’t have a crash pad (a thick foam pad placed at the base of the boulder; it cushions the climber’s feet in case he or she falls from the boulder), we didn’t go all the way up the roof. Rather, for safety, we climbed up and traversed sideways. For me, bouldering is an excellent way to practice, develop, and improve rock climbing techniques. Sweetie’s winning form! 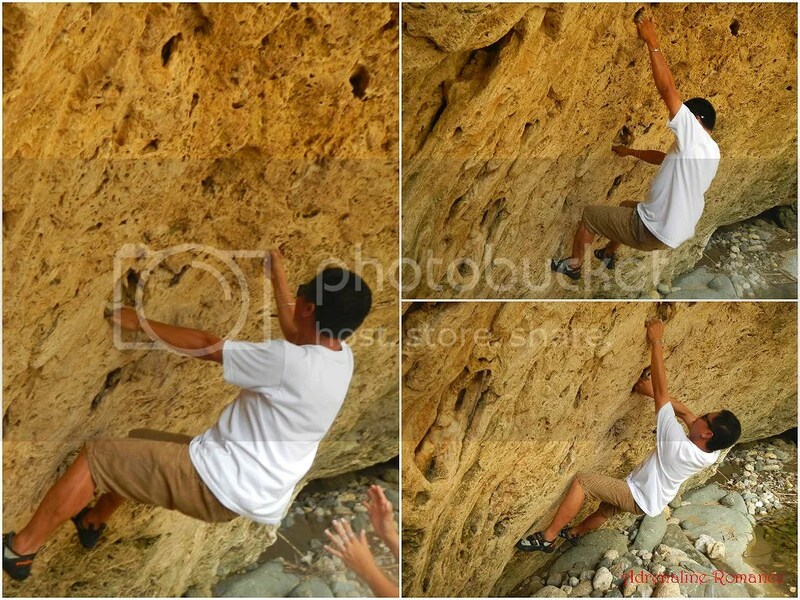 Sir Juvy of the Compostela tourism office acted as a spotter. In case Sweetie falls, Sir Juvy will direct the fall so that she lands on her feet rather than on her back or head. While roped rock climbing emphasizes on balance and endurance, bouldering focuses on a climber’s strength, power, and form. 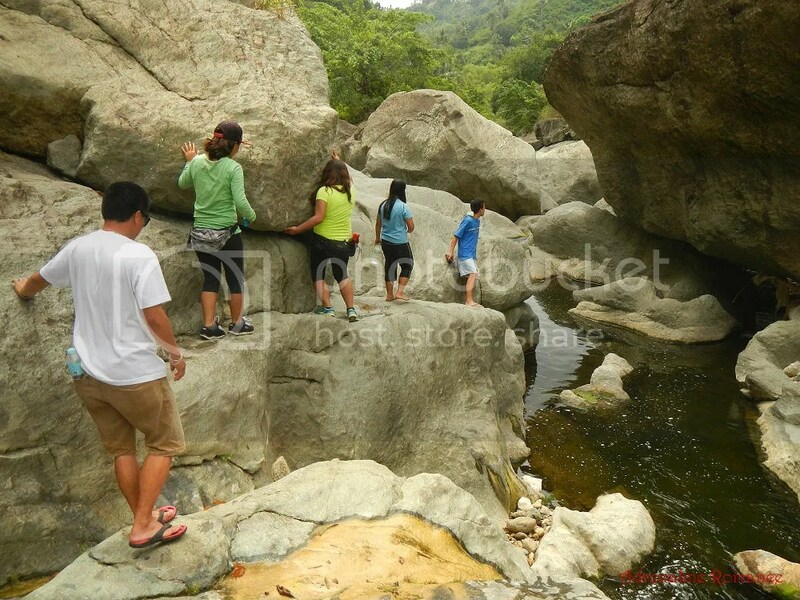 Discovering the potential of Mulao River as a boulderer’s paradise, Agnes tried climbing the boulder. 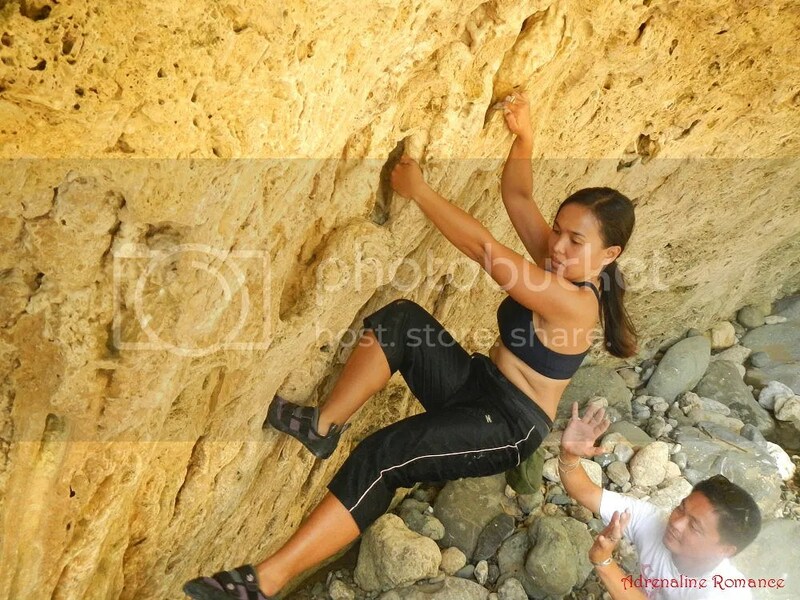 She later said that it’s quite challenging even though the rock face wasn’t high. But she also remarked she had fun, and it’s a good exercise. Then it was Sir Juvy’s turn! He’s got good form. Reynen, Agnes’s sister, put up a good, fun fight! 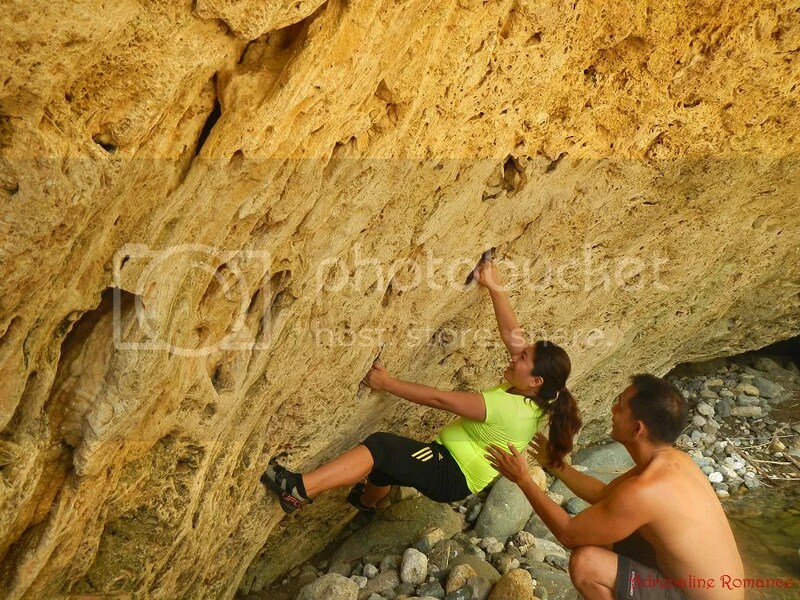 She loved bouldering and is looking forward to join us in Cantabaco. Inspired by crazy people climbing the sacred boulders, our young guides began to try their hand in choosing and ascending rock faces. They truly enjoyed the activity. 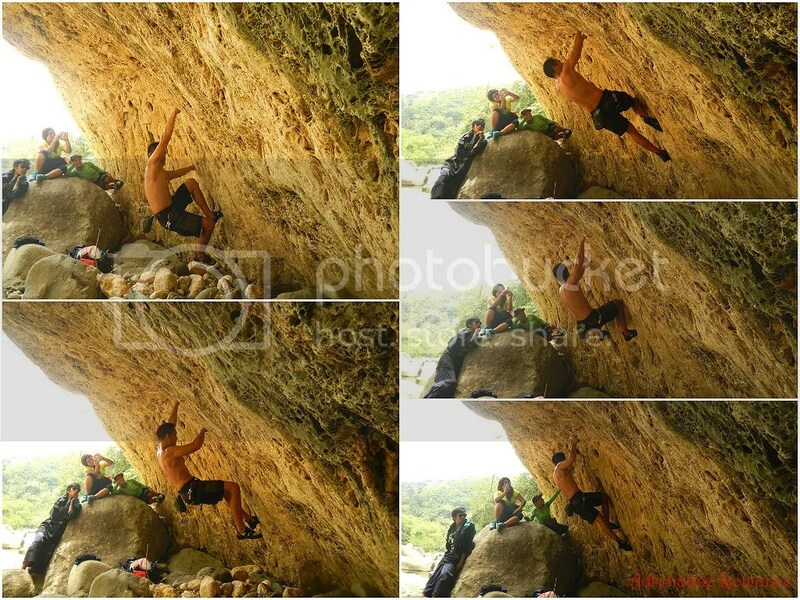 Hmmm, are we seeing the beginnings of a climbing/bouldering trend here in Mulao? We hope so. After an hour or so of bouldering, we became really hungry. Our tummies signaled us that it was time to go back and have lunch. We thanked the spirits for keeping us safe and headed back upstream. Along the way back, we observed patches of algae. Algal blooms such as those patches seen below are rapid increases of the population of algae. The algae “rob” the water of oxygen, suffocating aquatic animals and plants. 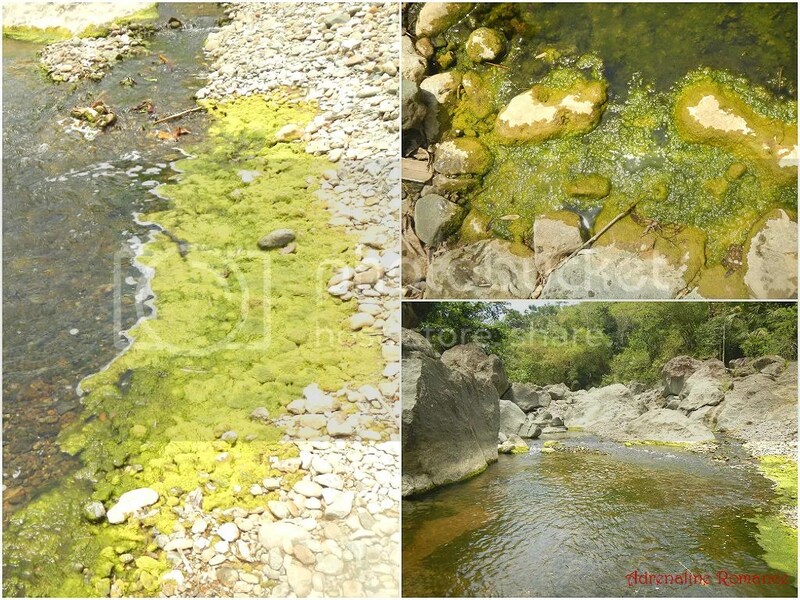 Algal blooms occur when extra nutrients such as fertilizers and chemicals that are applied to the land for both agricultural and recreational purposes are introduced to the water. In other words, algal blooms are evidences of pollution. At seeing beauty, serenity, and magic of Mulao River, we strongly believe that it is indeed the realm of Nature’s guardian spirits. 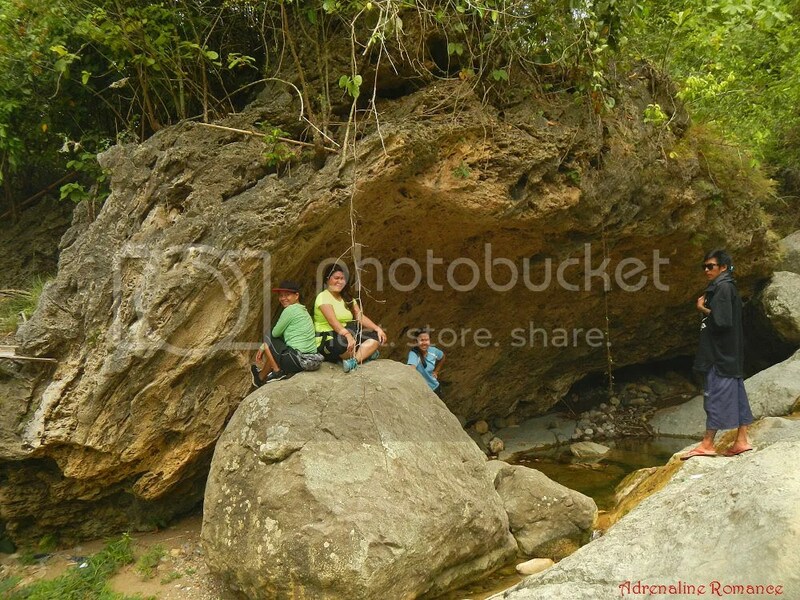 Thank you very much, Agnes, Reynen, Juvy, and the Compostela LGU and Tourism Office for touring us around your natural treasure. Thank you too to the local guides who took care of us, who showed us the way, and who told us the whispered tales of the river. With all the history and mysticism surrounding it, the unique Mulao River is truly a promising eco-tourism and cultural destination. 3. If you opt to go directly to Ka Sisoy, look for Letchel Rieta or Michael Duazo for guideship services. If you go to Mulao Baranggay Hall, the barangay officials will provide you your tour guide. 4. 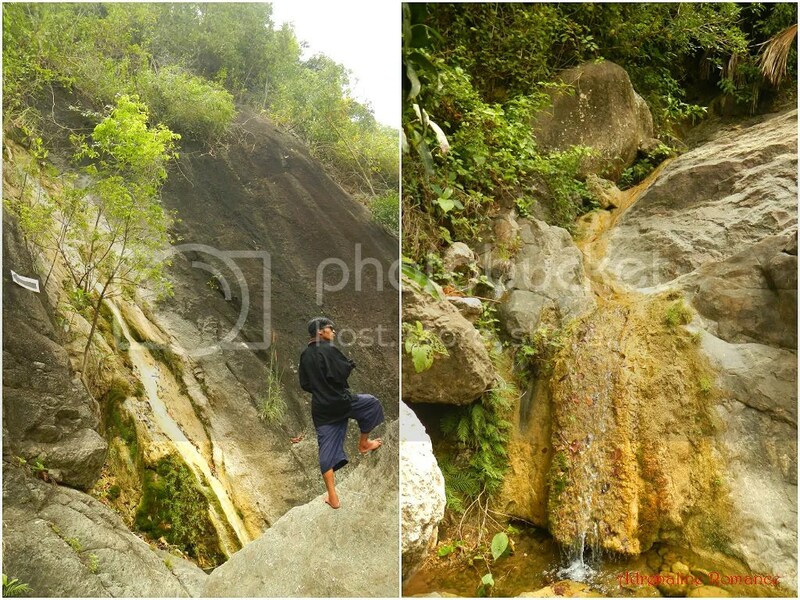 There are no licensed guides to take you to Mulao River. Most likely, your guides would be locals who would agree to accompany you to the river. Negotiate a price with them; P200 to P300 would be a good benchmark. However, make sure that the guide you’ll be taking should be familiar with the place. Remember that locals themselves hardly venture to the river because they believe it is taw-an (enchanted). This is exactly why it is highly recommended to coordinate with the Compostela Tourism Office; they can provide you with a knowledgeable guide. 5. The locals are superstitious and regard the river with great reverence. Respect them and listen to their tales with interest. Do not make fun of what they believe in. 8. Keep the river clean by not throwing any trash in it. 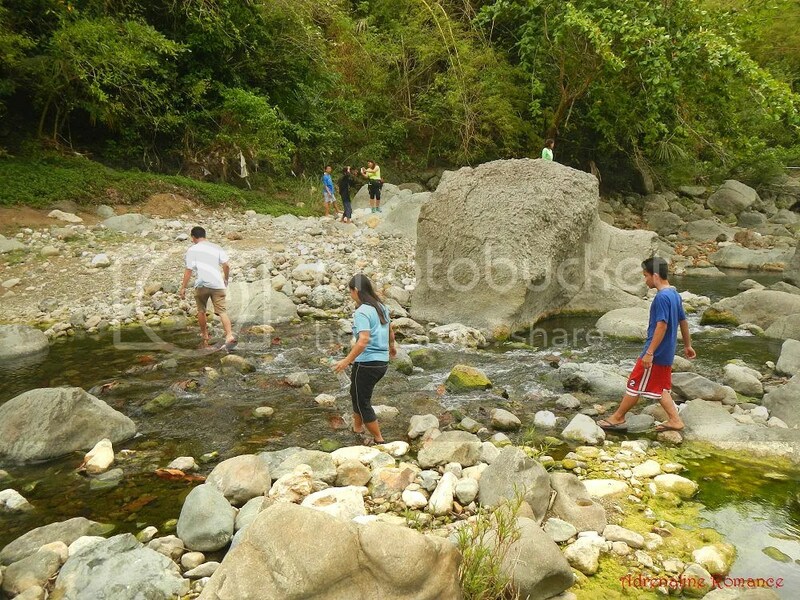 Be responsible and do your share in making Mulao River an exciting eco-tourism destination in Compostela. This place is magical, almost other-worldly. I hope it stays pristine forever. The local government and whoever is in-charge of tourism for this place should ensure that man’s encroachment will not destroy this place. Local residents ought to be educated about leaving this area clean, untouched and with no trace of garbage. am hoping that we will be able to visit this place someday. Thank you for reading the blog post. Oh yes, the Mulao River is definitely enchanting; you can really feel the enkantos, anitos, druids, and spirits watching over the place. 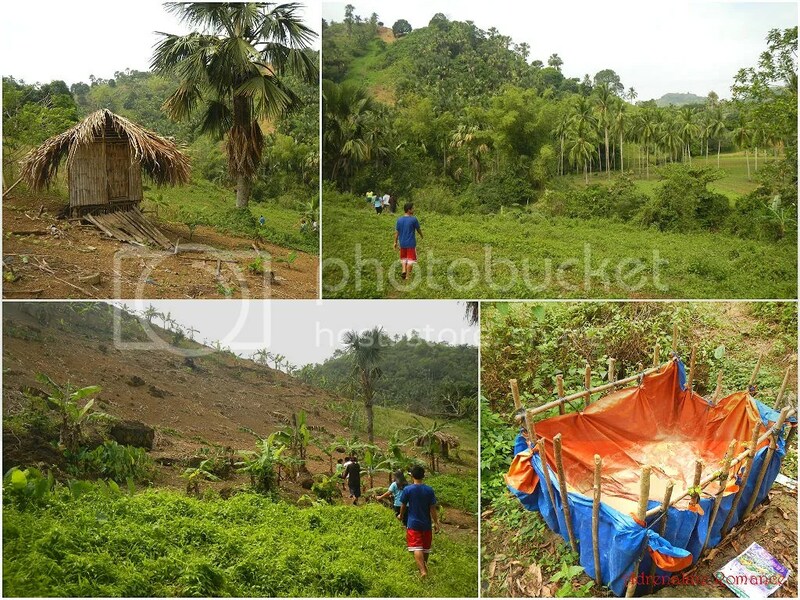 The good thing is that the local government has recognized its potential as an eco-tourism destination. Thus, we’re pretty sure that there wouldn’t be a garbage problem. But we do hope that human encroachment would not expand. As of the moment, the edges of the farms that surround the area are a considerable distance from the riverbanks, and few people venture out here. We do hope that it stays this way, even if it becomes a popular eco-tourism destination in the future. This is post is amazing. I agree with you Mulao is breathtaking! I had my chance of seeing the place way back Feb 2012 when I joined the Columbia Eco Trail Run. Hope to visit the place again. Thank you so much for visiting our site. It’s an honor, actually, to have a trail runner check out our website. Indeed, Mulao River is a beautiful, unique river. The rock formations are simply gorgeous. 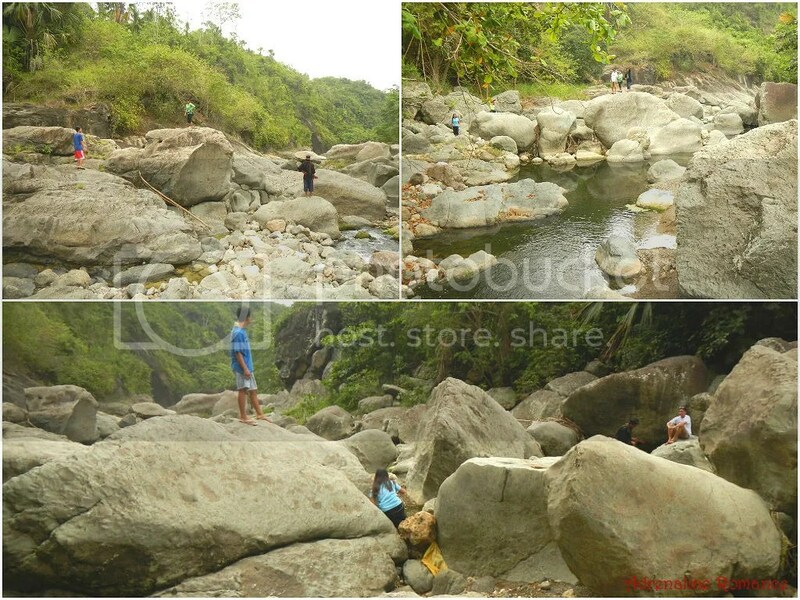 We just hope that the LGUs of both Compostela and Liloan realize its huge potential as an eco-tourism, adventure, and bouldering destination. 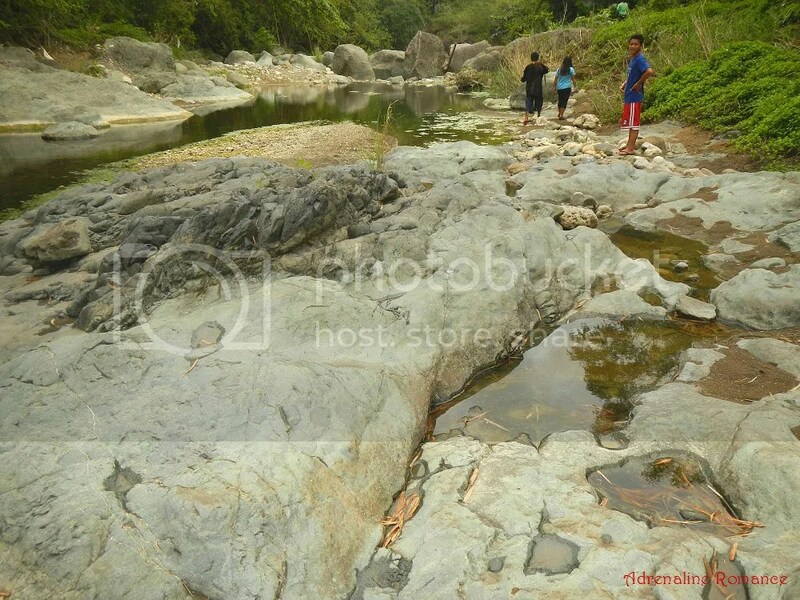 Pwede ka ligoan ang river??? 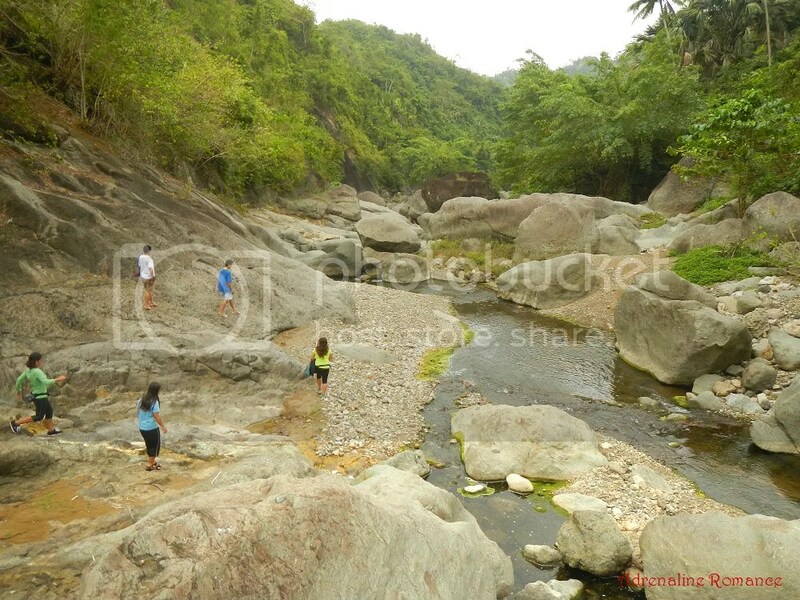 taga liloan ko pero wla pa jud ko ka ara..
Well, according to the locals, there are parts of the river where it is safe to take a dip. Just ask your local guide. Thanks!